"Use this cult favorite for smoking, baking, roasting, and more." "Despite the lower price, this provides 742 square inches of total cooking space." "Smoke everything from cheese to seafood with this pellet grill and smoker." "A smaller, electric alternative to the traditional wood pellet grill." "This grill is built for easy moving with the all-terrain wheels and lift handle." "Made from 304 stainless steel so it will last for years in any weather." "Convention cooking ensures more consistent roasting, baking, and grilling." "Can comfortably cook pizzas up to 13 inches in diameter." "The burn system creates convection airflow for evenly cooked steaks." Talk to any grilling or smoking enthusiast, and they're sure to mention Traeger grills at least once. Their products have developed a cult following due to their impeccable quality and attention to detail. Our top pick in this category is the Traeger Lil Tex Elite 34 Pellet Grill, which is more than just a backyard cooktop for your burgers. You can use this grill for smoking, baking, roasting, and more. Temperature is simple to set with the dial control, just like using your oven, and it keeps the temperature steady within plus or minus 20 degrees so your food will cook evenly. The electronic ignition makes this easy to start, and the simple on/off switch makes it just as simple to turn off when cooking is done. Big enough for a family or a party, this has a whopping 646 square inches of cooking space and plenty of headroom, so your Beer Can Chicken has plenty of space to stand tall. The grill grates are coated with porcelain enamel for easy cleaning and great grill marks, whether you’re making burgers or messy, saucy ribs. Locking casters make the grill easy to roll into position and then lock into place, so it won’t roll if it gets bumped. Traeger also makes their own branded hardwood pellets that are free of fillers or additives, which you can use in this grill or other pellet grills, for a high-quality grilling experience but you can also use your favorite non-Traeger pellets in this grill. If you're looking for a wood pellet smoker at an affordable price, you should consider the Trail Embers Pellet Smoker and Grill. This pellet smoker and grill is perfect for occasional grillers and for beginners who want to get familiar with pellet cooking before they commit to a high-end model. Despite the lower price, this provides a generous 742 square inches of total cooking space, including 550 inches of primary space and 192 inches of secondary space, so you’ll be able to cook for parties with ease. The body is made from powder-coated steel and it has porcelain coated steel cooking grates that will withstand rust and corrosion. A foldable front shelf gives you space for cooking tools and sauces, then folds out of the way when not in use, saving space on your deck or in storage. Steel wheels let you roll it across your deck or into your storage space when grilling season is over. You can smoke everything from cheese to seafood with this pellet grill and smoker. Adjust the temperature with the controls while the automatic auger feeds the pellets without any work on your part. You can set the temperature from 160-500 degrees for all your favorite recipes. Press a button and the convenient meat probe will switch from displaying the internal grill temperature to the temperature of your food. If you're worried about cooking space, this grill gives you plenty of room with a total of 570 square inches of space, including an upper warming rack that’s perfect for keeping foods at serving temperature or warming up your burger buns. Cleaning the grill is just as easy as using it, since it has a unique ash clean-out feature. Just pull a lever and empty the ash cup. Camp Chef also sells their own branded wood pellets for use in this and any other pellet grill. For a smaller, electric alternative to the traditional wood pellet grill, we love the unique kettle shape of this model along with the rear hopper that makes it more compact so it will take up less space on your deck or in storage. It only offers 411 square inches of cooking space, so if you're going to be grilling for a large crowd this may not be the best option for you. You can set the temperature from a simple dial that offers 11 settings from 159 to 500 degrees (the operation is fully automatic). The lighter starts the pellets and holds the correct temperature. A meat probe is included, so you can also monitor the internal temperature of the food as it cooks. Shutdown mode turns the auger off while burning any remaining pellets, so you can start fresh the next time you cook. This grill is built for easy moving with the all-terrain wheels and lift handle so you can move it from one location to another. Whether you're bringing it across your neighbor's yard or to a vacation home, this grill is made to move with you. While it’s easy to move, this still provides 450 square inches of cooking space on two tiers, so it’s large enough for everyday family meals and small parties. The permanent side shelf and collapsible front shelf give you an extra workspace to hold tools, sauces, plates, while you flip burgers and grill steaks for a crowd. This grill maintains heat and adds pellets to the fire automatically, so you won't have to constantly monitor it to ensure consistent cooking. Other handy features include an LED display to show you the current internal temperature and a spigot for easy grease removal. If your idea of outdoor cooking includes an outdoor kitchen, this built-in pellet grill will be the perfect fit. It’s made from 304 stainless steel so it will last for years in any weather while remaining rust- and tarnish-free. The grilling grates are nickel-plated steel, for easy cleaning and durability, providing 844 square inches of cooking space for the family or for parties. Made for long-term cooking projects, this has a 24-pound hopper that will let you cook for up to 62 hours without refilling, and it can cook at 180 to 700 degrees. The cooking area has an oven-quality gasket that keeps the smoke and heat in, for perfect flavor and efficient fuel use. While you might love that outdoor kitchen, you don’t need to stay there to monitor your cooking, since this can be controlled with Wi-Fi using an iOS or Android app. Fan-forced convection cooking adds an extra level of versatility to this wood pellet smoker, as the fan distributes the heat throughout the cooking chamber for more consistent roasting, baking, and grilling. You’ll get even cooking on the top, bottom, and sides of your whole chicken without needing to rotate it. This cooks from 180 to 475 degrees and keeps the temperature steady within 10 degrees. It has automatic ignition for easy starting and an automatic feed system that sends pellets into the fire to maintain the heat and produce just the right amount of smoke. The 700 square inches of grilling space gives you room for entire family meals or backyard barbecues. When cooking is done, the waste oil collector makes it simple to remove the oil and food drippings, while the cart with locking casters makes it a breeze to move this across the deck or into your storage space. If cooking pizza is your thing, this pellet-fired oven will have you making wood-fired pies in no time at all. This wood pellet pizza oven heats up to 930 degrees in just 10 minutes, so you’ll have the grill ready by the time the pies are topped. This can comfortably cook pizzas up to 13 inches in diameter, and can also be used for meats, seafood, and vegetables, as long as they’re not overly tall. A cordierite stone baking board is included for pizza, flatbreads, and similar foods, and a casserole dish and sizzle pan are also available. You can use your favorite cast iron skillet for meats and vegetables. The grill itself is made from stainless steel, so it can withstand the weather, but it’s lightweight enough to easily move for storage or travel. The height is ideal for tabletop cooking, while the three-leg makes it stable on uneven ground. An optional gas burner is available to operate this on propane, in case you run out of pellets. 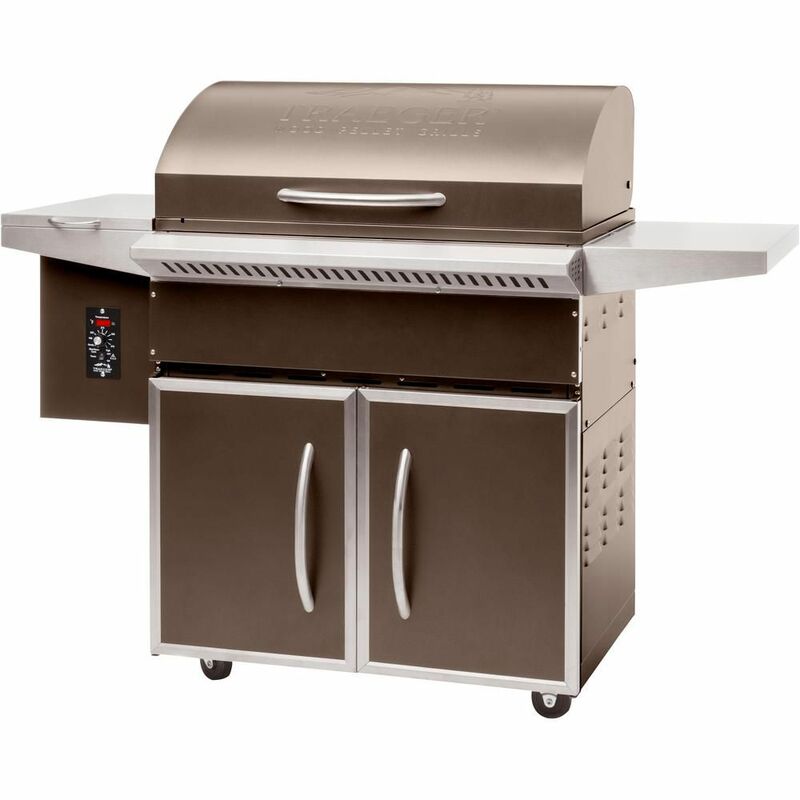 The unique flame broiler on this grill makes it ideal for broiling steaks, chops, and burgers, while it’s also a fully-featured pellet grill and smoker. The unique burn system also creates convection airflow for even cooking on the top, bottom, and sides of the food. The cooking grids are porcelain-coated cast iron and the removable warming rack is coated steel. The 707 square inches of cooking space on two tiers makes this great for cooking for the family or for a crowd, and the meat probe makes it easy to monitor the internal temperature of your food. This has easy-to-use digital controls that let you set the temperature from 180 to 600 degrees in 5-degree increments. Our writers spent 6 hours researching the most popular wood pellet grills on the market. Before making their final recommendations, they considered 12 different grills overall, screened options from 12 different brands and manufacturers and read over 20 user reviews (both positive and negative). All of this research adds up to recommendations you can trust.